We're happy to let you know that we have a stock of Organic Local Frozen Blueberries from the Blueberry Ranch in Granger, IN. You'll find them in our freezer section at the Co-op. Our kitchen prepares all of the great-tasting food on the Salad bar from scratch every day using organic and seasonally local ingredients. For these reasons, it is important that we charge appropriately for this high quality food. We hope that the discounted price for Member-owners will encourage those of you that have been teetering on that decision to join or not. For those that make Cafe Max part of their regular eating - paying for the Member-owner equity will likely pay for itself with this new benefit. Check out a list of the December Deals for Member-owners. Look for the YELLOW price tags in the store that has MBR SALE! on them. We're passing on the savings to our Member-owners. This Thursday - January 12 at 7:30. All Member-owners are welcome. We always reserve the first part of the meeting for Member-0wner input/feedback. Location: Emnet, downstairs in the Emporium building on Niles Ave, South Bend. 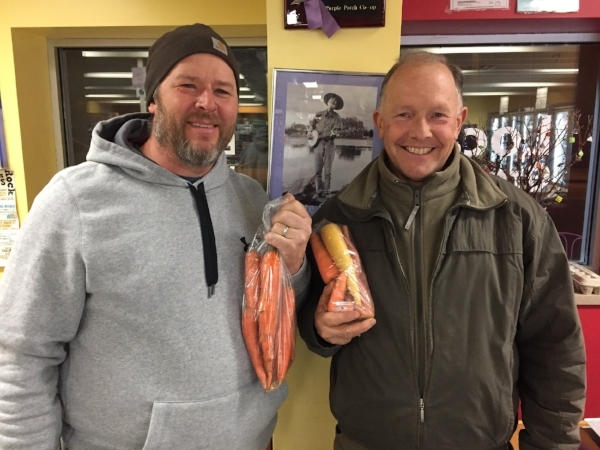 Local Producers Chris Hebron and Joe Gady (in good company with Pete in the background) displaying their beautiful carrots - both available this Wednesday! Ordering is Friday noon through Monday 7pm - Click on the link and Bookmark it in your web browser. Everyone is welcome to use this online ordering system. Or just show up - meet your local producers on Wednesday 5:00 - 7:00pm (NEW HOURS FOR THE COLD MONTHS).